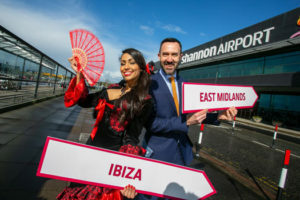 Shannon Airport has launched two new 2w flights to both Ibiza and East Midlands Airport. Ryanair will operate the Ibiza service every Wednesday and Sunday, with 21,000 seats. The timing and days of week allow for great flexibility for a short or long stay option. Nina Smalle celebrates the Ibiza announcement at Shannon Airport with Andrew Murphy, Managing Director of Shannon Airport. Ryanair has also launched a twice-weekly service to East Midlands, with 22,000 seats. The timing and days of week allow for great flexibility for a weekend break or for a week-long business trip. Andrew Murphy, Shannon Airport Managing Director, said it is an exciting time for the airport. “Ibiza is a brilliant addition to our summer sun schedule. We have already seen the success of the year-round Ryanair service to Alicante and with other sunshine destinations including Tenerife, Lanzarote, Barcelona-Reus, Fuerteventura, Faro and Malaga.